How do we assist clients to see beyond what they currently have as space and re-imagining what it could be? Not just bigger, but actually better. It can be challenging for many healthcare clients to see beyond their current accommodation and understand how the architecture shapes the provision of healthcare. The visioning processes that we employ to assist clients with these paradigm shifts are simple and straightforward, but require considerable up-front work to be effective. Who are we, what are our goals, who are our clients, what are their goals and how do we bring these together, are the first questions that must be asked. But rather than asking them as direct questions, it can be more effective to conduct some visioning exercises to assist clients to get to know themselves better, before we start the design process. 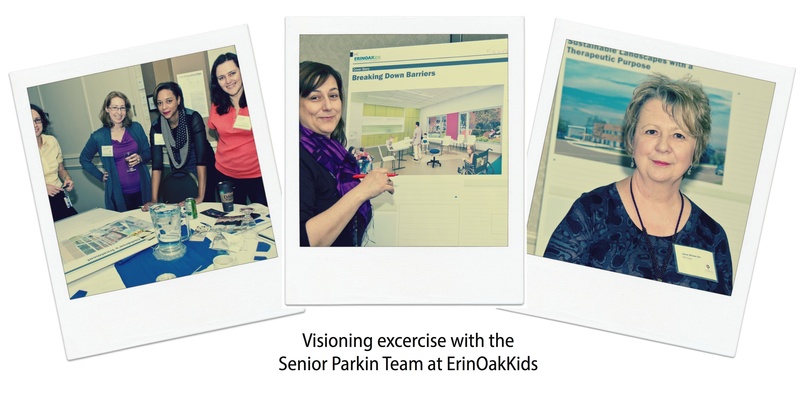 Visioning works best when it is carefully planned but includes individuals and groups with a wide variety of backgrounds, differing needs for healthcare processes and divergent viewpoints. If everyone already shares an identical vision for the future, there are reduced opportunities for new ideas to transform the organization and its facilities. In an Integrated Design Process (IDP), the participants include community groups, neighbourhood groups, consultants and representatives from the client from a wide variety of backgrounds, in order to elicit new ideas and challenge conventional thinking. At a visioning process that we participated in several years ago, participants were asked to choose an image from a selection that was to illustrate to those present what their emotional reaction was to the new facility. Photos that they could choose from included images of gardens, traditional buildings, people, tranquility locations, kites, mothers and babies, etc. One of the individuals who lived just north of the proposed new hospital chose an image of a hose spraying water up into the air. It was playful, exuberant and felt as though it expressed a wish for a lively and fun-filled place. Everyone congratulated him on his choice until he explained his rationale. He said he felt that he was being ‘hosed’ by the institution as they really didn’t care what the impact of the new facility was going to be on his property. At this point, the room went silent as everyone realized that in their excitement over the project, they had forgotten the next-door neighbours. This single comment resulted in a very intense and productive discussion about neighbourhood needs, the impact of the facility, sun angles and shading, parking and access points and noise from emergency vehicles that had a profound impact on the design of the facility. one group of clients, we asked them to envision the newspaper headlines from their local paper on the day the organization opened to the public. They were to choose images of what the facility would look like inside and create headlines, call-outs and quotations that expressed their goals for the facility. Working in teams that included management staff, caregivers, therapists, family representatives, consultants and government officials, each group had a theme to illustrate. Again this created intense discussions about priorities for the new facility, specific ideas about interior spaces and, as one of the participants said, “Not only do we know our consultants better, we know ourselves better as a result of this process”. Understanding who they are, what they want from a physical space, and how a building can assist them to provide the best care, are key issues for healthcare clients. As architects, we are passionate about helping them to do that. Visioning is just one of the tools that we use but it is one of the most instructive (and fun!) to do.